Good job too on the projects you are making to donate! I've found that beginners just want encouragement. Frequently, students will ask me to read something they've written. I always say something nice about it. If they wanted me to critique it would be completely different. Glad you're doing A to Z. I'm signed up, too. That’s how I felt about this beginner. She was so enthusiastic. I wanted her to keep up her interest. 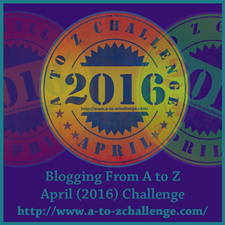 Hey Lindagrace - I look forward reading your A-Z blogging posts next month. I'm not going to do it this year.